It’s been 2,649 days since UFC 100, the event in which Dan Henderson iconically knocked out Michael Bisping. It’s a knockout that is often in every UFC highlight video, one in which has eaten away at Bisping. Now, over seven years later, Bisping is the UFC Middleweight Champion and Dan Henderson at 46 years old, is fighting for the only thing he’s never captured in his mixed martial arts career, UFC gold. Co-Headlining the card, is Middleweight contenders in Vitor Belfort and Gegard Mousasi. Belfort, is looking to get back in the win column, after Ronaldo Souza thumped him in the very first round back at UFC 198. Meanwhile, Mousasi looks to build off a two-fight win streak and continue his climb in a very stacked Middleweight division. Also on the card, a very intriguing bout at 205 lbs., as hometown favorite Jimi Manuwa returns to the octagon against Ovince St. Preux. Anyways, let’s just get to the Predictions! 185 lbs. : UFC Middleweight Champion Michael Bisping vs. Dan Henderson – It’s a rematch between an unlikely Champion in Bisping and even unlikelier contender in the 46 year old Dan Henderson. Michael Bisping, holds a 19-7 record in the UFC and is coming off a shocking, yet very deserving knockout victory over then Champion Luke Rockhold. In a career that never amounted to a title shot, Bisping took advantage of a being a late replacement in a title fight against Luke Rockhold. The circumstances weren’t the greatest, especially given that Rockhold had already handily defeated Bisping before and the fact that it he only had so little time to prepare. However, Bisping rose to the occasion and captured UFC gold. He’s a well rounded fighter, that primarily looks to stand and use his superior cardio and volume striking. Henderson, is 9-8 in the UFC and is one the greatest mixed martial artist on the planet. His legendary career includes simultaneously capturing the Pride Welterweight and Middleweight Championship, as well as winning the Strikeforce Light Heavyweight Championship. The only thing missing, is a UFC Championship and at 46 years old, he finally gets that opportunity. Henderson has also stated that this is his retirement bout. Primarily a striker, Henderson holds the keys to one of the greatest weapons on the planet – the right hand dubbed the H-Bomb. He’s also an Olympic wrestler, but he’s long forgoed using his wrestling. As for a prediction, I’m going to side with Dan Henderson. 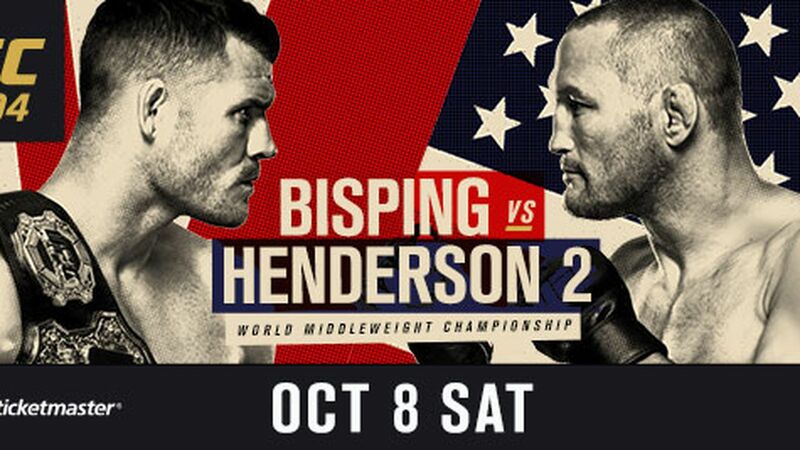 I know that the safe pick is to go with Michael Bisping, but there’s something about this storyline that has me thinking Henderson caps off a legendary career with the only thing he’s never won, a UFC Championship. While Bisping will hold the speed advantage and will attack Henderson with volume, prior to his last fight, he’s got rocked against Thales Leites and Anderson Silva. His chin held up, but an H-Bomb is a different story and Bisping has known that since UFC 100. The last thing to go in a fighter is power, which is why I’m taking Henderson for conceivably the last time. So with that, I have Henderson via KO! 185 lbs. : Gegard Mousasi vs. Vitor Belfort – An all important bout in the Middleweight division, as the victor catapults themselves into title contention. Mousasi, holds a 6-3 record in the UFC and has rallied off two straight victories in a row. The middleweight contender will be vying for his 40th mixed martial arts victory at the mere age of 31. Mousasi is one of the more well rounded fighters in the UFC and has really proven of late, that his striking is some of the very best in the division. Belfort, is 14-8 in the UFC and clearly is going to have a spot in the UFC Hall of Fame. Most recently, Belfort got dominated by Ronaldo Souza. However, the former UFC Light Heavyweight champion has maintained top contender status in the Middleweight division for over five years. In other words, don’t count out the Brazilian Blitzkrieg who would love for Mousasi to stay on the feet with him. As for a prediction, I’m going to side with Gegard Mousasi. If there’s a recipe to defeat Vitor Belfort, it’s to put him on his back. It’s been rinsed and repeated by Chris Weidman and most recently Ronaldo Souza. Of course that first round and initial exchange plays heavily in the favor of Belfort, but Mousasi is a smart fighter and I’m sure will exploit Belfort’s weakness right away. So with that, I have Mousasi notching win number 40 via TKO. 205 lbs. : Ovince Saint Preux vs. Jimi Manuwa – A firecracker of a fight at 205 lbs., with a finish all but expected. Saint Preux, holds a 7-3 record in the UFC, most recently dropping a decision defeat to the pound for pound best Jon Jones. Beginning his UFC career with four straight victories, Saint Preux has of late fell on hard times. However, he’s still a contender in a relatively weak Light Heavyweight division. Saint Preux is an athletic monster, who has heavy hands and is a solid grappler. Manuwa, is 4-2 in the UFC, most recently feeling the wrath of Anthony Johnson’s power. A highly touted fighter entering the UFC, Manuwa reeled off three straight victories, all by TKO. However, a recent string of injuries and lack of success have plagued his UFC career. Manuwa is a primarily a striker, who with 13 knockout victories to his name, has I guess some power. As for a prediction, I’m going to side with Ovince St. Preux. The man is just an athletic freak and is very well rounded. Manuwa is a beast too, but his lack of fights of late and 36 years of age, I’m thinking we’ve seen his peak already. So with that, I’m going with OSP to win this fight via late submission. Struve, holds a 11-6 record in the UFC and is coming off a 16 second victory over Antonio “Bigfoot” Silva. The victory was definitely satisfying, considering his previous bout was a snore-fest defeat to Josh Rosholt, in which he was taken down and slept on most of the time. Struve is a kickboxer and skilled grappler, who at 7 feet tall holds a 84.5 reach. In other words, the only way to defeat him, is to get inside. Omielanczuk, is 4-2 in the UFC and has reeled off three straight victories. It’s a credit more so to Omielanczuk’s heart that he’s won three consecutive bouts, as in each fight he’s overcome adversity early. He’s not the most talented, but he wins on his “will” to win. Omielanczuk is a grinder, who relies on his opponents tiring. As for a prediction, I’m going to side with Stefan Struve. He’s drastically better on the feet and if the fight hits the mat, I’m fairly confident that Struve holds the advantage on top or on the his back. Omielanczuk has surprised me thus far and Struve has suspect cardio, so anything is possible, but I think Struve is the better pick here. So with that, I have Struve via submission. 145 lbs. : Mirsad Bektic vs. Russell Doane – I would break this one down, but then again, Doane steps into this on short notice and on the heels of a three-fight losing streak. I give him credit for stepping up with his UFC career on the line, but his wrestling isn’t going to save him against one of the UFC’s best prospects in Mirsad Bektic. So without further ado, I have Bektic late submission. 135 lbs. : Brad Pickett vs. Iuri Alcantara – A pair of veterans collide in a bantamweight contest that potential have careers in the balance. Pickett, holds a 5-6 record in the UFC, most recently staving off a potential UFC pink slip by defeating Francisco Rivera. Had Pickett lost, it would of been four consecutive defeats. However, Pickett won and is looking to make it two straight. Primarily a striker, Pickett embraces the brawl, which more often than not eliminates his wrestling abilities. Alcantara, is 7-4 in the UFC and is most recently coming off a loss to rising talent Jimmie Rivera. When Alcantara arrived in the WEC, he knocked out Ricardo Lamas, creating a buzz about the potential bantamweight contender. He lived up to the expectations early in his UFC career, going 6-2, even looking impressive in defeat against Urijah Faber. However, Alcanatara is 1-2 since then. He relies heavily on leg kicks when standing and on the ground, either his vicious ground-and-pound or slick submissions create an outlet for victory. As for a prediction, I’m going to side with Brad Pickett. While I favor Alcantara standing due to his leg kicks, when taken down, he’s shown that he can be subdued by a top heavy wrestler. Alcantara also fades in fights, while Pickett has shown to have great endurance. While the safe pick here is Alcantara, Pickett is fighting in his hometown and I expect any close rounds to go to him. So with that, I have Pickett via decision. 135 lbs. : Davey Grant vs. Damian Stasiak – I don’t really know who Stasiak is, but I’m very well aware of the Ultimate Fighter 18 runner-up Davey Grant. Anyways, I’m going to once again side with the hometown favorite and pick Grant to take this via decision. 170 lbs. : Leon Edwards vs. Albert Tumenov – A welterweight clash that features two up-and-coming talents. Edwards, holds a 3-2 record in the UFC, but is 3-1 in his last four fights. His most notable UFC victory to date, came back at UFC Fight Night 64, when he knocked out Seth Baczynski. Edwards is good athlete with solid striking abilities. Tumenov, is 5-2 in the UFC, most recently falling defeat to Gunnar Nelson. The defeat halted a five-fight win streak, one in which saw him nearly cracking the top ten at 170 lbs. Tumenov is a well rounded fighter and very much in every sense of the word, a prospect. As for a prediction, I’m going to side with Tumenov. I believe that he’s just too solid everywhere to lose to Edwards. And while Edwards is a talented striker, I’d favor Tumenov at his own strength. Tumenov holds the power advantage and ability to take this fight wherever he wants. So with that, I have Tumenov via knockout! 155 lbs. : Marc Diakiese vs. Lukasz Sajewski – I have little knowledge of both guys, so I’m not going to break this one down by any means. I’m just going to side with the hometown favorite Marc Diakiese, who is heading into this undefeated. So with that, I have Diakiese via knockout! 170 lbs. : Mike Perry vs. Danny Roberts – A welterweight contest, that should be heavily contested on the feet. Perry, holds a 1-0 record in the UFC, most recently making a successful debut fight against Hyun Gyu Lim at UFC 202 back in August. He’s primarily a striker, who has bombs in his hands. Just ask all eight of his opponents, who he’s knocked out. Roberts, is 2-0 in the UFC, defeating the likes of Nathan Coy and Dominique Steele. The British fighter is well-rounded and more defensively sound than Perry’s last opponent Lim, who almost welcomed to be punched. Roberts is a good boxer, but also capable of taking the fight to the ground and submitting his opponent. As for a prediction, I’m going to side with Mike Perry. I really was impressed with his striking abilities in his debut, albeit his opponent Lim didn’t understand what striking defense was. Anyways, I haven’t been overly impressed with Roberts and I liken Perry’s power to be the factor in this fight, leading to another knockout victory. 155 lbs. : Adriano Martins vs. Leonardo Santos – An intriguing matchup in the lightweight division, as a pair of rising veterans look to continue their climb. Martins, holds a 4-1 record in the UFC, with the lone defeat coming way by Donald “Cowboy” Cerrone. Of the four victories, he’s finished three of them, which in turn have awarded him bonuses in each. Martins is a BJJ black belt and a very well versed striker, who is noted for having legit power. Santos, is 4-0-1 in the UFC, most recently picking up a huge TKO victory over highly touted prospect Kevin Lee. The Ultimate Fighter: Brazil 2 winner, is also a BJJ black belt and a counter striker. As for a prediction, I’m going to side with Adriano Martins. I believe both have exceptional ground abilities, which most likely will cancel each other out, leading to what I foresee as a striking match. On the feet, I favor Martins, due to his powerful strikes. And despite Santos being a counter puncher and having not lost since May of 2009, I fully expect him to eventually crumble when he feels the power of Martins shots.